Over time, the skin under the chin and along the neck begins to lose elasticity, which compromises its ability to conform to connective tissue and other underlying structures. This skin laxity can create the appearance of a double chin or saggy neck in even the most health conscious individuals. A neck lift is a surgical procedure designed to reduce excess skin, remove fat deposits, and tighten muscles of the neck to regain a youthful jaw line and a smoother, more slender neck. 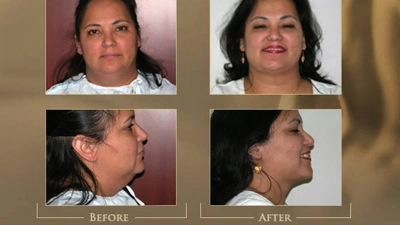 Please contact the Plastic Surgery Center of Austin to schedule a consultation for neck lift surgery. The procedure begins with a few small incisions along the undersides of each ear and beneath the middle of the chin to reveal the muscles of the neck. At this point, the skin is separated from the underlying tissue, and fat deposits are removed using liposuction techniques. The muscles of the neck are then tightened and sutured into place to ensure long-lasting results before the skin is lifted and excess is removed. The incisions are closed carefully to minimize visible scarring. Patients who have undergone neck lift at our practice often emerge looking years younger. Their necks appear tighter and longer, revealing a smooth jaw line. Neck lift is often performed in conjunction with other cosmetic procedures, such as facelift, BOTOX® Cosmetic therapy, eyelid surgery, or brow lift to achieve comprehensive facial rejuvenation. Contact us for more information about neck lift, or to schedule a consultation with one of our surgeons.